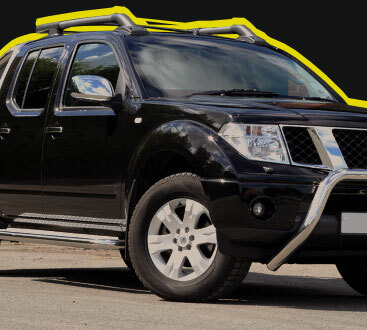 While there are many different ways to customize your truck to look and function the way you want, many people forget that nerf bars are a truck accessory that look great and actually serve a function! If you want to find a new set of nerf bars for your SUV or truck, contact us today at Safari Truck of Jacksonville. In addition to a large selection of durable nerf guards, we are also an authorized Line-X dealer and installer. 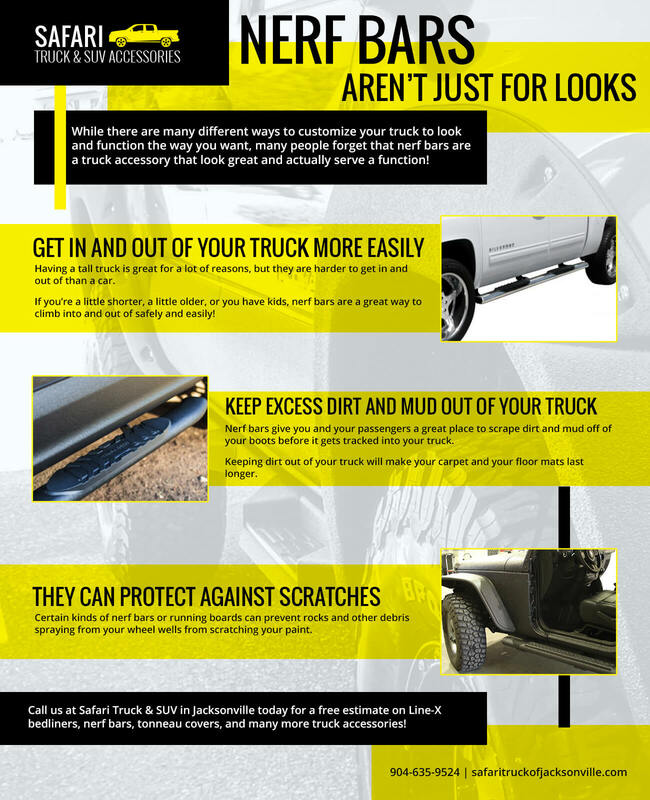 Protect your truck today with a new bed liner, or have us apply this incredible protective coating to other parts of your vehicle for unmatched protection! We also carry a wide selection of tonneau covers and grille guards. Whether you want to protect your vehicle from the hazards at a job site, the grocery store, or the great outdoors, Safari Truck & SUV Accessories has everything you need to keep your truck safe while also making it look cooler. Having a tall truck is great for a lot of reasons, but they are harder to get in and out of than a car. If you’re a little shorter, a little older, or you have kids, nerf bars are a great way to climb into and out of your vehicle safely and easily! At Safari Truck & SUV in Jacksonville, you will have a large number of options to choose from. Some are designed for style while others feature flatter top sections with plastic or rubberized areas for safety. Whether you work on muddy job sites, you own a farm or ranch, or you like to spend your time mudding, you probably get pretty filthy from time to time. While some dirt in your truck is just a fact of life, that doesn’t mean you have to track half the outdoors into your truck or SUV. Nerf bars give you and your passengers a great place to scrape dirt and mud off of your boots before it gets tracked into your truck. Keeping dirt out of your truck will make your carpet and your floor mats last longer. Driving with dirty shoes or boots can also be a safety issue, as it can make it more difficult to feel how hard you are pressing on the gas and brake pedals. While we all know that your truck will eventually get some scratches and dings in the paint, that doesn’t mean we have to invite it to happen sooner rather than later. Certain kinds of nerf bars or running boards can prevent rocks and other debris from spraying up out of your wheel wells and scratching your paint. Whatever your reasons for needing a new set of nerf bars, we have a selection that is unrivaled in the Jacksonville area, as well as the lowest prices and the best customer service. 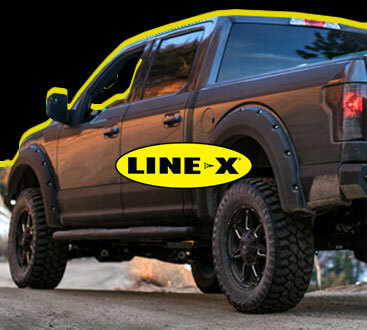 Call us at Safari Truck & SUV Accessories in Jacksonville today for a free estimate on Line-X bed liners, nerf bars, tonneau covers, and many more truck accessories!